Archangel Michael connects in this .MP3 angel message to assist you in clearing and opening your heart chakra. You will receive a powerful heart healing in this angelic activation, as Archangel Michael along with your Guides and Guardian Angels assist you in fully attuning to divine love. This message from the angels is simple, but the energetic broadcast from Archangel Michael is profound. I hope you enjoy this message… I felt completely refreshed and lifted after listening. Simply relax, breathe, and listen to this new, up to date free angel message and heart healing from Archangel Michael..
You will feel refreshed, balanced, and re energized after listening… Simply relax, quiet your mind, and open your heart to receive the full energetic broadcast from Archangel Michael… it is a lovely experience! Or keep reading as this message has now been transcribed and is available below! Beloved one, indeed I, archangel Michael, am here. You are greeted with many of your guides and guardian angels. You are greeted with the energy of divine love, of complete acceptance, and understanding. You are greeted with our respect and with our blessing. And I, archangel Michael, invite you now to surrender and let go of the mental mind oriented way of perceiving reality and begin to practice tuning in to the observer. Open your heart and step back as if you are looking down from above, watching you meditate now, watching you simply be in a state of peace, of calm, of still despite whatever turbulence, excitement, or chaos flows around you in the outside world. For, dear one, as you are able to quiet your mind, open your heart, and be at one with the moment, as you are able to do this in your day to day life, you will be able to call upon this valuable skill in times where waters are turbulent, in times where the atmosphere on earth is chaotic. This tool in your tool belt will be available to you then, but only as you practice and claim this tool, claim this ability, for yourself. For we angels offer you these blessings with open arms, however, you, dearest one, must be the one to take them and to integrate them. Change and growth do not happen without you or outside of you. It is your inner capacity to evolve and expand that brings blessings in the outside world to the forefront. It is your inner state of being that is mirrored in outside reality. And so, yes, there still exists inner turbulence even in you, dear one, who has come so far on your path of evolution, on your personal journey that is by no means complete. Many, indeed, say that it has yet to even begin. And so before we continue, the process is simple. Breathe, be, let your mind be still, let your ego be calm, focused on a blank screen before you, allowing whatever is to simply be, and now opening your heart allowing your conscious awareness to enter in. Your heart is the sacred portal allowing you to access the higher realms, allowing you in this moment, and in any moment, to tune in to all that is, to tune in to divine love and light, to tune in to the still, peaceful gap, the void, the darkness, the stillness, the calm within. And so take a deep breath and drop in and it is if you are being surrounded by a hug of peace, a hug of calm, quiet, still. Enter into this, for this place serves you. This is your point of creation. This energy in and of itself will heal and will realign you with your purpose. This is the space by which you are able to receive direct guidance from the divine. This is where the full power of love becomes available to you. It is always here, in every moment, and so quiet your mind, open your heart, and enter in. Is it still, peace, and calm that you find therein? Or is there some lingering doubt or fear or ego thought that comes up for you now? What comes up? The goal is still, is calm, is love, and all that is not this comes up now for you to let go. Do you not see that the turbulence in your outside world is a direct reflection of who and where you are right now? You are energy and you are all that is. Your neighbors, your friends, the world around you, the slowpoke in traffic in front of you, it is all you, it is all your experience designed to remind you of who you really are. It is not outside of you that you will remember, but these outside influences seek you, seek to tune you in to your inner world, and from within, from the calm, from the void, you are able to create all that you desire around you. And so, dear ones, on a global scale, on the changes that are happening in your world, the struggle, the revolution, the collapse, this happens, all that is happening, all your current struggles and strife and challenges and conflicts simply seek to return you within you, to return you to the ultimate power available to you on the planet at this time. Do you not see? You are powerful, you are light, you are angelic in your true form and birthright, and yet, that which is around you, that which you see and experience and perceive does not necessarily prove to you that you are power and that you are spirit. It is by going inward and being still and being calm and then from this place planting the seeds of thought, the beliefs, the intentions that you desire to see manifest in the outside world around you, this is the mode of creating beneficial changes in your reality. The time is not now to look outside, to look at others, to look to the outside world to bring you the magic, the romance, the mystery, and magnificent experience you desire, you yearn for, your heart calls out for. You are here to experience great meaning and growth. Your life is meant to propel you forward on your journey of reuniting with all, with God, with life that you are a part of, you are one with, you are all of. And the only way that you can fully experience and understand these worlds that are spoken to you now is to take a deep breath and still your mind and listen rather with your heart and with your spirit, with your soul. This inner world, this inner place, serves you greatly, tremendously. It is here that you are able to know your purpose that, again, comes from within you, not without. You may see things in your world that you say, “No, how can this be? This is not what I am creating, this is not what I want.” But it is currently what you are. You are challenged, your world is challenged now for long. You have been caught in a dualistic battle of right and wrong and dark and light until this point. And this is why you are here, for the lines of duality are blurred. You are able, in a sense, to take the elevator up above this world of magnificent contrast and challenge and struggle. Yes, the pendulum swings both ways and the challenges you have had serve you by providing contrast for the incredible joy and light and love you can, you deserve, you are able to create and manifest in your experience. Not from without you, from within. There are triggers in your outside world, things that urge you to change. But if you try to first change these things in a physical way, you may be blocked. You may have a roadblock or it may feel challenging. Action in the outside world is required, but let it be preceded by planting the seeds of intention in your inner space, in your inner world. 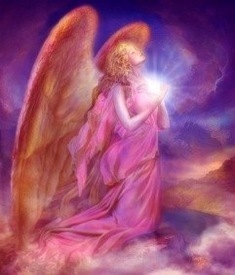 Dear ones, there is some talk that the angelic realm is limiting it's help to the earth at this time. I, archangel Michael, am here to say this is not true. We are always present and always eager and willing to help, however, you are elevating, you are elevated, and you are stepping into the role of creator. Do not simply pray and wait for blessings to occur in your life. Yes, pray. Yes, ask for help. But then meditate, let your heart chakra open and enter into the sacred portal you find therein. This place, this stillness, this is a fertile ground for manifestation, this is where you are able to declare your truth: I am living the life I desire, I am living abundantly and joyously, co-creating with planet earth and with all creatures. I am accomplishing my goals and dreams. By first setting these intentions and then regularly reconnecting with your sacred inner world, you will continue to be guided and as you declare what you desire to create and then return to the still and calm of meditation, of entering in to the sacred portal of your heart, you will know what to do next. You will know when action is required and when it is not. Let your heart be your guide. This is nothing new, but what it means is that entering in, for in your heart is a sacred communication chamber by which you are able to link directly with the guidance, that source, that God, that sprit, that all that is has for you in this moment, in this time, in this now. By quieting your mind, imagining that light and angels are all around you, for we are, and opening the doors of your heart wide, let the light shine in, let this light now lift and release that which has served its course. The pain, the trauma, the suffering, the tension, the jealousy, the rage, let it go. Let it go into the light. Let all that limits your heart chakra from fully opening be gone, banished, returned to the creator’s light. Now lifted in wings of love up and out of your energy and into the light and now, once again, visualize consciously opening the doors of your heart, open them wide. If you find pain behind these doors, let it go. Drop it, your angels are on hand to take it away. It no longer serves. What serves is the sacred portal of love. Open and enter in. Open your heart and drop in. Love is here, love is all, and as you are able to, from this inner state of being, perceive the love all around in all the world even the challenges that happen now are based in love. Seek at some level to return you to your full connection with spirit. Know this and so the challenges to come in the days to follow, know that they are not maliciously intended. They simply seek to return you to source, and so give thanks for challenge. Give thanks for chaos if this is what appears on your path. Give thanks for all that is and this gratitude will keep moving you forward. You are here, dear spiritual being of light, you are here to open fully to your power, to your truth, to the full understanding of all that is, and your role, your part in the greater whole. You are one with everything, remember this and know that by breathing, by calming your mind, and by entering into your heart and opening the doors wide and tuning into the peace you find there, the love, the light, this activates your power, your spirit, your might. This activates your authentic self, the spiritual you, the powerful you, the loving you, the you that is physical but is also connected and remembers that connection to all that is from this inner place. Intent or ask to be aligned with your highest and greatest good. Know that, yes, this is serving others. Your service escalates your growth and you are here to grow into your full being. You are at the brink of a new becoming, the dawn of a new day. A new beginning is here for you, and so let go of all that you have been, let go of who you are to step in, to step into the truth of your full magnificence. The process is simple, repeat it often: open your heart, breathe, and enter in, for this sacred portal unites you with source, with God, with your angels, with your guides, with your soul and spirit. Know that all is well and remember that the challenges simply urge to unite you with more of your truth. A challenge always precedes growth, but you have the choice: Do you grow? Do you leap over the hurdle and move on to the next? Or do you tune into fear and cower and turn away? Now is the time to face what is happening around you and within you. Now is the time for you to claim your power. You do this in every moment, you do this one moment at a time. You always have the choice to respond first or to tune in first. Tune in to love and let love be your guide. Love is the spark, love is the flame that burns, love is what catapults you forward into your master of light in physical form. This is the role, this is what you are here to accomplish, and the only way to achieve it is from within to without. Create an energy first and then take action as you are guided. Many changes are needed now, yes, this is true. The outside world will trigger you in ways, will show you where you are still limited, will give you challenges. Meet these challenges with love and with an open heart. Integrate them into your being, take your next step forward, respond with love, and take time to breathe, to go within, to open the doors of your heart, and enter into the sacred portal, your sacred space, your inner world. This serves you, this empowers you, and now is the time to claim your power. It is here, the time is now, you are the one. Enter in, open your heart, and lift. That simple act increases your vibration tenfold, and with a high vibration you are not limited, all things are possible. And so cut the ties now to negativity, to doubt, to fear, to that which you were, which holds you back from becoming all that you are. You are the light, you are magnificent, and you are loved. But to fully step into this, you are required… open your heart. It’s that simple. Shine your light, be your truth in every moment, and when you find that you are responding out of fear, release. When you find that you are back in an old habitual pattern that does not serve, let it go and return to love, and like that, you’re back in the flow. You are reconnected, you are one with I, archangel Michael, with source, with God, with goddess, with all that is. You are one, you are a part of it, and so you have the ability to create profound change, radical transformation. It begins and ends in you. Open your heart and so it is. I, archangel Michael, leave you with my blessing. We are one and you are so dearly loved. We are always near, call upon us for assistance, but remember, all that you must do is quiet your mind, open your heart, breathe, enter in, and simply be, and lift, and love. And so it is, goodbye for now. Thank you for reading this beautiful channeled message by Archangel Michael. If you would like more messages from Archangel Michael, Click Here! Something about this is making me cry. I need to listen to it when I am somewhere that I can cry. I know my heart needs help and that I need to process something and I think this message is helping bring those things out so that I can see them and release them and get better. Thank you, Melanie, for this. How do you channel messages? How do you write them down? When did you first acknowledge that who inspired you were angels? My youngest son died 15 years ago after a long battle with cancer, he was in his 20s. My wife feels that he’s around us and I have dreams with him trying to find him and always come empty handed, I wake and have this anxiety that lasts for couple days sometime. Thank You so much for all your help Melanie. I so needed this to validate what my deceased husband is telling me. He keeps saying …You Are Loved. Don’t be so sad. Receive Love…….still so very hard. Thank you so much! It was exactly what i needed to lift me up from the darkness, fear, and anxiety i am living in these days! It was so uplifting and brought peace to my heart! Thank you! Thank you so very much!! I really truly needed this at this time of my life! Shine on with this amazing message and POWERFUL MEDITATION ! Thank you so much!!! just in time ! i´m needing so much these words and guidance!!! Thank you so much for being an open channel for others to be blessed.